Our BioSmart Basic Edition is anything but basic! 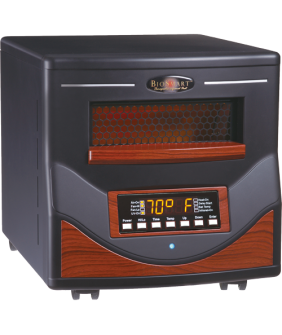 In fact, the BioSmart® Basic Edition has more standard features than almost every competitor on the market, including a full digital display and programmable thermostat and will easily out-perform other similarly priced heaters on the market! 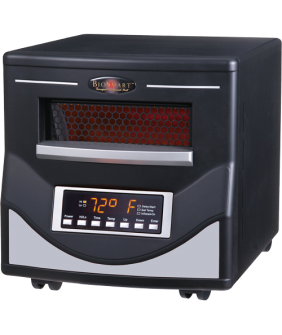 The BioSmart® Basic Edition Far Infrared heater features insulating ceramic liners in our proprietary heating chamber for added noise suppression and heat retention, an ultra quiet powerful fan, and larger, more efficient 120 volt quartz infrared heating elements enhanced to a 30,000 hour lifespan. This combination produces efficient infrared energy that can heat up to a 1,000 sq. ft. and provides more heat than any other portable infrared heater on the market. 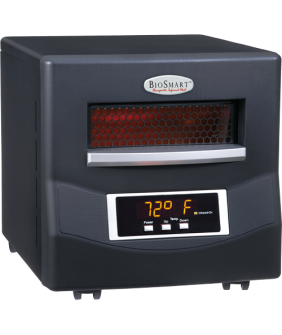 BioSmart® Basic Edition heater’s design incorporates serviceability features not found in other portable heaters. In the unlikely event that a component must be replaced, the BioSmart® heater is designed for complete component replacement in just a few minutes. Parts are always available through BioSmart Technologies. Our heaters feature a high quality solid-state modular design, packed with many innovative features and built to provide many years of dependable service. COMPARE all our BioSmart® portable models. Simply plug the BioSmart® Basic Edition Heater into any household grounded outlet and start saving! Maintain Minimum 30% Humidity – 35-40% relative humidity is ideal for maximum heating efficiency. Cleaning Filter – Checking the filter once a week and cleaning the filter no less than once a month will allow maximum airflow through the machine. Concrete Floor/Walls – Concrete is a heat sink and naturally absorbs any heat in the room. It is therefore best not to have the heater right on the concrete but to place & secure it a few feet above the concrete floor. See your Owner’s Manual for troubleshooting instructions, or contact our customer service department toll free at 1-800-595-9605.